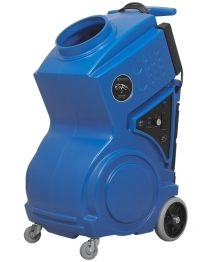 The lightweight Abatement PRED1200 Portable Air Scrubber (PAS) delivers outstanding air scrubbing performance in an ultra-strong, rotational molded polyethylene cabinet. Weighing only 70 pounds with filters, the PRED1200 produces an eye-popping peak airflow rating of 900 cfm at 3.5 amps or less! HEPA Filter - 14.25" OD Round x 12"